"[Ideas holdup] makesense creative workshop for Olistic Label "
OLISTIC THE LABEL explores the connection between human and earth. Inspired by nature fabrics are only made with natural certified organic fibres. Produced in Portugal, OLISTIC THE LABEL seeks to bring a positive social impact by creating jobs and empowering women. The community create luxury and unique handmade embroidery. It does not follow trends or seasons, but we will offer timeless and limited collections. The pieces can be personalized and adjusted to fit different types of bodies.In the OLISTIC way, the brand promote a slow lifestyle where trust, passion and respect is the core. Makesense is a playground with a purpose: they offer a chance to get involved and to make a real difference to the world. A chance to work on issues that citizens really care about with other people who share the same passion. The vibrant community of Makesense Geneva includes passionate entrepreneurs and keen citizens who work actively together to solve urgent social and environmental issues. makesense Geneva hotspot. We join our forces with Fashion Revolution Geneva to promote sustainable fashion. 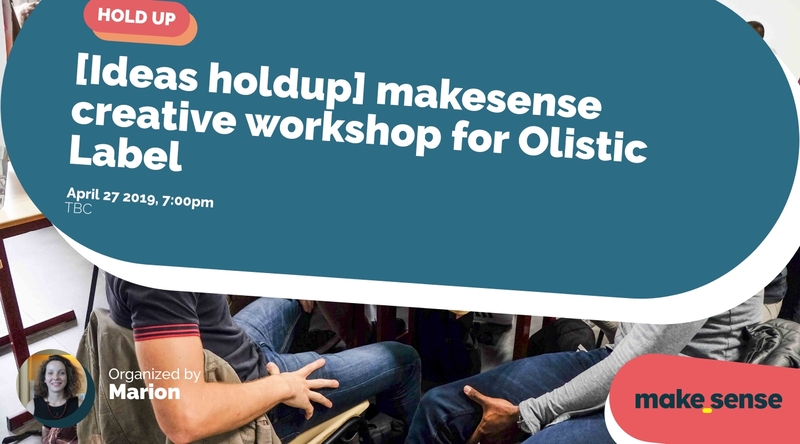 The event is called a ‘Hold-up’, and are often used by makesense because they provide creative and practical solutions to any problem a social entrepreneur might encounter. Every participant is invited to discuss, exchange and build during the 1h30. It is open for all, no particular skills necessary and no need to have ideas before the workshop!